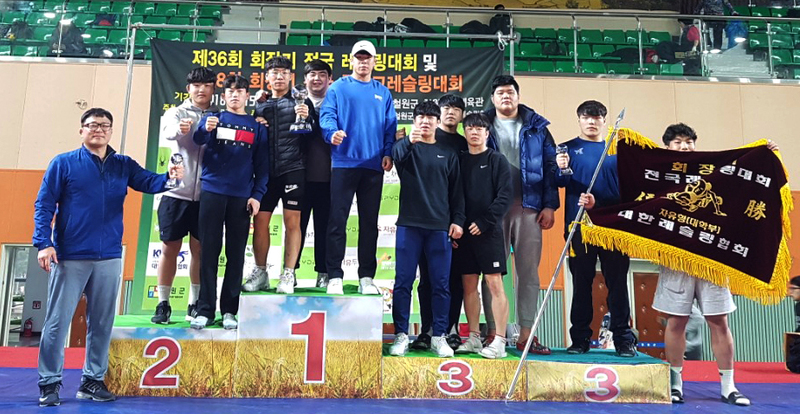 The YU wrestling team won a total of eight medals including two golds, three silvers and three bronze medals in the collegiate section of the championship at the Cheorwon Gymnasium in Gangwon-do from the 15th to the 18th to place first overall. At this tournament, Park Cheol-woong (21, College of Special Physical Education senior, 97kg) and Kim Yong-hak (20, College of Special Physical Education junior, 74kg) won gold medals, Kim Jong-won (20, Sports Science senior, 86kg), Park Chang-hwan (19, College of Special Physical Education sophomore, 92kg) and Gong Ji-min (18, Sports Science freshman, 61kg) won silver medals, and Kim Sung-soo (20, College of Special Physical Education senior, 125kg) Ahn Jae-yong (20, Sports Science junior, 57kg) and Han Hyun-soo (19, College of Special Physical Education sophomore, 125kg) won bronze medals. Park Cheol-woong, who won the gold medal in the 97kg and under division, received the MVP, while YU Wrestling Team Coach Kim Ik-hee won the Best Coach Award for his efforts to win overall first place. The YU Wrestling Team also swept a total of eight medals such as four golds, one silver and three bronze at the 28th National Fall Wrestling Tournament to take overall first place. At the most recent championships, it maintained its position as the best collegiate wrestling team.